Maybe it's human nature, but we love to lump things into categories. Yes, in many ways, this can make like easier, and in some cases, even safer. We know what we like, what to avoid, what can help us, and what can hurt us. However, when it comes to entertainment, I think that we often too far with attempting to classify things and creating genres which then beget sub-genres. For decades, movies haven't been allowed to simply be movies. In the early 70s, films which featured predominantly African American casts were known as "Blaxploitation" films. In the 80s, we began to see more movies aimed at the LBGT community, and this became its own sub-genre. I'm sure at first glance, many would want to place Life Partners into that category, but it proves that sometimes movies are just about people. Sasha (Leighton Meester) and Paige (Gillian Jacobs) are the closest of friends, spending much of their free time together watching reality shows or hanging out with their peers. However, they have their differences as well. Paige is a lawyer who has a promising career. Sasha is an aspiring musician who works as a receptionist, and rarely works on her music. The other big difference between the pair is that Sasha is gay and Paige isn't, as they still compare notes over awful relationships. Things change when Paige meets Tim (Adam Brody) on a blind date and things begin to get serious between them. Suddenly, Paige doesn't have as much time for Sasha, who is forced to take a hard look at her life. On the surface, Life Partners may look like a shameless attempt to take a cliched idea and give it a modern twist by adding a gay slant to it. How many times have we seen movies where close friends suddenly experience a rift because one enters a serious relationship? We've seen this story where the friends were two heterosexual men or two heterosexual women. Does Life Partners think that it's doing something controversial by making one of the characters a lesbian? Is this sort of a reverse version of Chasing Amy? The answer is no, and this is what makes Life Partners likeable. Is Sasha a lesbian? Yes. Is the movie overly concerned with that fact? No. This is that rare movie where people are people and they aren't defined by things like sexuality. Now, Life Partners does open with Sasha and Paige attending a Gay Pride rally, which may throw some viewers off, but after that, the movie doesn't feature any politics or real statements about gay culture. Sasha's issues are presented just like any straight character in any other movie -- she's broke, she hates her job, and she feels that she's growing apart from her best friend. The distinction here is that being a lesbian is part of who she is, but it's not who she is. I feel certain that some feel that this weakens the film, but I beg to differ. By laying off the gender and sexual politics, Life Partners becomes a much more approachable film. This allows it to focus on the characters and the situations. This is a true "slice of life" film, so we don't get a ton of story or any plot twists. The focus here is on relationships between the characters and how they deal with the events in the movie. The romance between Paige and Tim feels very authentic, especially Paige's reluctance to fall for someone who doesn't seem like her type. Similarly, Sasha's trouble finding someone to be with is interesting, as she meets plenty of women, but she doesn't feel the connection to them which she has with Paige. If anything, Life Partners is too benign for its own good. The movie is pleasant and I did laugh a few times, but I also found it to be somewhat dull in spots. Thankfully, again, the characters feel authentic and the acting is good. The ending is pretty strong (with a strong showing by no less than a t-shirt) and you'll walk away from the movie feeling good. Life Partners may feel like it's anything but progressive, but it's ability to focus on characters and not stereotypes certainly felt progressive to me. Life Partners made me crave Jack in the Box on Blu-ray Disc courtesy of Magnolia Home Entertainment. The film has been letterboxed at 2.35:1 and the Disc contains an AVC 1080p HD transfer which runs at an average of 28 Mbps. The image is sharp and clear, showing no overt grain and no defects from the source materials. The colors look very good and the image is never overly dark or bright. The depth is notably good for a low-budget film like this and the image is never soft. The Disc carries a DTS-HD Master Audio 5.1 track which runs at 48 kHz and an average of 3.5 Mbps. The track provides clear dialogue and sound effects. Being a rom-com, we don't get a lot of dynamic effects here. There are some scattered stereo effects which have audio coming from the left or right channels, and the music in some bar scenes emits from the rear speakers. 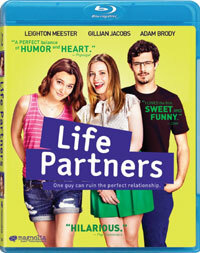 The Life Partners Blu-ray disc contains a few extras. "Behind the Scenes: Cast & Characters" (3 minutes) is a brief featurette in which the primary actors are given a few seconds to describe their characters or what drew them to the project. "Behind the Scenes: Production & Costume Design" (5 minutes) allows Production Designer Matt Luem and Costume Designer Courtney Hoffman to talk about the sets and the clothes and the overall look of the film. "AXS TV: A Look at Life Partners" (3 minutes) is like a trailer with some comments from Meester and Jacobs thrown in. The final extra is a TRAILER for the film.